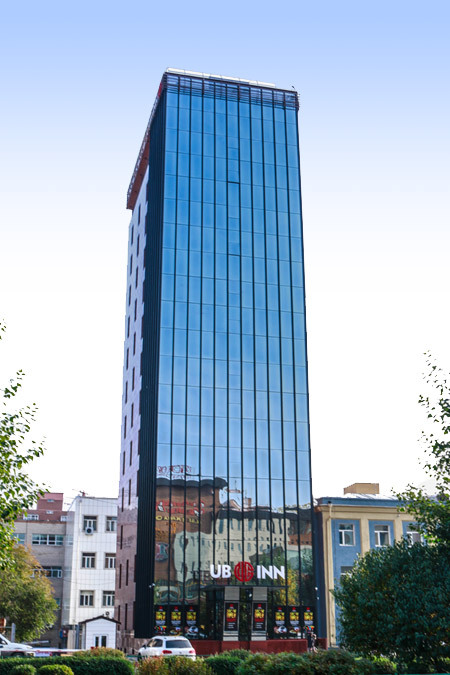 UB INN HOTEL & GALLERY is located in the city's central zone. In a peaceful and busy surrounding, the hotel stands in elegance offering you a convenient stay. The Hotel owns 33 delicately furnished guest rooms of various types, with each and every facility and amenity displaying taste, comfort and meticulous care. The Hotel takes care of the pleasant experience of your taste and gourmet food exploration. The fine 'Khadag' restaurant delivers you the unique taste of Mongolian cuisine along with the delicious Mediterranean taste from Italy; the 'Emeel' Lobby Bar offers you extensive list of classic and trendy drinks and refreshes your day with original Italian coffee and tasty bakery; while the 'Toono' lounge bar offers you fresh juices and cocktails accompanied by art performances. The chefs' creative efforts together with the meticulous service from the attendants bring you noble dining experience and the combination of history, culture and traditions. The Hotel is well-equipped with all kinds of conference and meeting facilities, offering an ideal venue for important receptions, meetings and business banquets. The Hotel is also well-equipped with various types of fitness & recreation as well as shopping facilities, complementing your leisure and business activities. When you have some spare time, you may as well proceed to the terrace where there is an exquisite roof-top bar presents the spectacular view over the downtown of UB and open-air cinema. It is a tranquil heaven for you to relax in and get rid of the fatigue and stress of every day. Sincere at heart and committed by action! The Hotel is looking forward to welcoming guests of around the world with its heart-warming services and a respectful attitude. 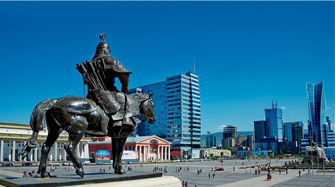 UB is an abbreviation of Ulaanbaatar - the name of the capital city of Mongolia. Founded in 1639 as the Palace for Undur Gegeen Zanabazar, the First Bogd Jebtsundamba - Leader of Mongolian Buddhism and direct descendant of great Genghis Khaan, the capital city has a history of 380 years. Being a nomadic Buddhist monastic center, the city moved over twenty times and settled in the Altan tevsh (Golden Trough) valley of present settlement in 1778. Named as Őrgőő (Palace), Nomyn Khüree (Dharma Encampment) and Niislel Khüree (Capital Settlement), the city obtained its present name of Ulaanbaatar in 1924. Although the name was given upon the advice of Soviet Communist Party representatives, now it's revealed that the name was given by Mongolians as a covert interpretation of Red Guardian deity of Buddhism that shall protect Mongolia from outer danger and threats and to protect the independence and sovereignty of Mongolia. Created by Nickolas Konstantinovich Roerich in 1927 during his stay in Mongolia in his research expedition to study Central Asia, this mineral-on-canvas painting is officially named as 'Ikh Ulaanbaatar' (Great Red Guardian Hero) and was presented to the People's Great Khural and the government of Mongolia. Painted in the style of Mongolian traditional fine arts, the painting is an inevitable explanation to the name of Ulaanbaatar. UB Inn logo is designed in the form of traditional Mongolian pattern that was derived from the ancient zoomorphic motif. This pattern symbolizes the sun and the moon, an interpretation of eternity. This pattern is also called as 'Lantsa' as a symbol of wisdom and knowledge, as it resembles the shape of ancient Ranjana abugida system of 11th century. This pattern is widely used in decorative arts of Mongolia and is seen everywhere, the wall and doors of monastery, hats, deel robe, boots and even on the buttons of attire, on household items or accessories, even on the ceremonial pastry. This particular logo pattern illustrates UB - abbreviation of Ulaanbaatar.